Imagine yourself walking through the jungles of Mexico in about 300 BC. You see light ahead. You stumble into a clearing, the trees obviously having much earlier been chopped down by someone. You hear voices. You look right, left. Still you see nothing. Then to your surprise, there are people all around, just looking at you from behind structures. Little known to you, you have entered the ancient Aztec city of Teotihuacan. Teotihuacan was a city from long ago, about 400 BC to 750 AD. It lies about twenty-five miles northeast of present-day Mexico City. The city was a very beautiful city (and still is), with the glory of all of its pyramids and temples. Of these pyramids, there were three main ones that caught the eye. 210 feet tall 738 feet across one side of the base Even though it was once 249 feet tall when it had a temple on top, it is still the third largest pyramid in the world. How the Pyramid of the Sun was built: It consisted of a series of platforms that gradually got smaller closer to the top. Then it was carefully covered with plaster. Archeologists think that it was then painted red and white. The people of Teotihuacan believed caves to be sacred, For this reason, the Pyramid of the Sun was built over one, so it would be a holy place. Pyramid of the Feathered Serpent:This is the smallest of the pyramids in Teotihuacan, but one of the most ravishing. It was ordered to be built in 150 AD by the ruler of that time. The pyramid was covered with huge serpent heads, each weighing over four tons each. The feathered serpent in Teotihuacan was a symbol of rulership, which explains why archeologists think that the ruler who ordered this pyramids building is buried inside. The temples in Teotihuacan were built in the talud tablero (tu-LOOD,tu-BLAR-o) style. This style was made by placing a large platform down, and on top of that a platform was one that was sloped inward at about a forty-five degree angle. Then a flat one, then a sloped one. It ends up looking something like a pyramid. They got all the stone for it from nearby quarries. They got the stone to the cities by using ropes and wooden rollers. This style of building was invented by the people of Teotihuacan. When the building was finished, it was covered with smooth plaster (ground up remains of burnt limestone into a fine powder, mixed with sand and water) and then painted. The outside of the buildings were sometimes brightly painted with animals, both real and imaginary. The paint color represented different things. Red represented blood and eternal life. Black represented shadows of the underworld. The rest of the paint depended on what they wanted it to be. The paint was made from natural dyes put directly on to wet plaster. The houses in Teotihuacan were made from wood and adobe (sun-dried mixture of clay and straw). The walls and base of the houses were made of concrete (crushed limestone with dirt and water). They used logs to build the roofs and to strengthen the walls and foundations. It is amazing these ancient Aztecs made as many glorious buildings as they did, because they did not use the wheel or beasts of burden. They didnt use the wheel because they had no animals to pull it. They used stone tools. Storm God:His name was Tlaloc, and he was the second most important god in Teotihuacan. He was the god of storms, lightning, thunder, and rain. It was believed that he lived in the clouds. The people thought he made lightning by striking a spear to a jar. That was also the jar that they thought he poured rain from. He is character ized in several different ways. As a cloud, he represents rainwater. As a jaguar, he represents thunder, because of the jaguars roar. As a snake, he represents fertility. Old God: This god is usually shown with a brazier on his back, in which to burn incense. Fat God and God of Spring: They both represent fertility, but the God of Spring is believed to be able to go into the skin of any person. The major goddess was Chalcheutlicue, one always shown with nature, lakes, rivers, fertility, and caves. She is always seen facing forward, but her face is hidden. The oldest ceremonial center was in the Cuicuilo(kwee-KWIL-ko). It has a huge circular stone base, 500 feet across the diameter. Around 200 BC, it was destroyed by an erupting volcano. 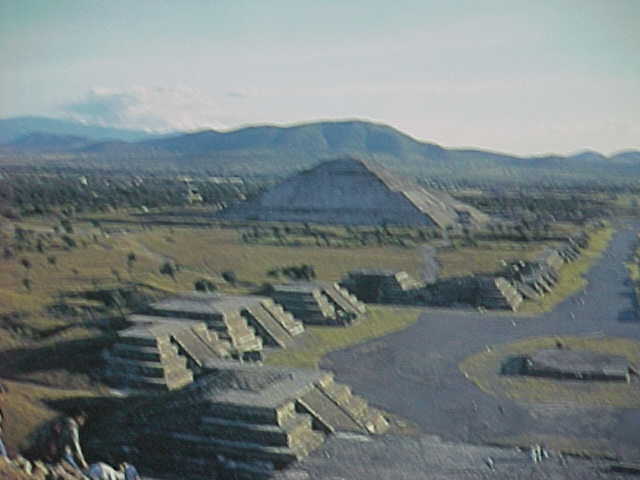 The central belief in Teotihuacan was that that was where the world was created and time began. More specifically, they thought it began in a cave in the city, because they believed that caves were sacred. A main landmark in Teotihuacan is the Avenue of the Dead. It is about one hundred thirty-one feet wide. Long ago during the time of Teotihuacan, it was probably three miles long. Now only about 1.4 miles of it are recognizable. It starts directly in front of the Pyramid of the Moon, and most of Teotihuacans important structures are around it. It was named when Aztecs of a later time walked the road and saw the buildings on the side and thought that they looked like tombstones. At one point, the people of Teotihuacan built a canal for the San Juan River so that it intersects the Avenue of the Dead at a ninety degree angle. One place in Teotihuacan, just west of the Avenue of the Dead, is a place called the Great Compound. It was probably once a marketplace with administrative offices. Teotihuacan was not only a city of religion, but a city of trade and polotics. The goods that the people of Teotihuacan traded were: obsidian, ceramics, cloths, and cloth made from a plant called maguey. The Avenue of the Dead and two other roads divide Teotihuacan into four sections. Teotihuacan was just a small settlement around 400 BC, but was an importanat city around 750 BC. Its population once got up to around two hundred thousand. It is twenty-five miles northeast of present day Mexico City. Moon and Sun Pyramids: They both once had a temple on top. They both were probably once dedicated to the great goddess. They also might hold the tombs of the early leaders of Teotihuacan. Only the priests were allowed to climb the steps of the pyramids for rituals and ceremonies.